Rapünzchen, a diminutive of Rapunzel, is a German name for lamb’s lettuce or field salad, a common winter green in Europe, but rare in Australia. I love it. It has a nutty, tangy, very distinct flavour. The leaves of baby spinach look somewhat similar, but the flavour is quite different and their relationship as salad greens is probably not close. Rapünzchen is the first alphabetical entry in my German woman’s household manual, volume eight. It is the only volume bequeathed to me by my ancestors. The last entry is Schuhwichse (shoe polish). The manual was published 176 years ago, in 1839. It is not easy for us now to imagine what life might have been like then, particularly for women. To get a better feel for this I thought I might investigate what was happening in the world around this time. The quickest way was trawling through the internet since I am quite experienced with this due to researching my family history. And so I found that Queen Victoria had ascended to the British throne just two years before this manual was published, and had not married yet. There was no German nation as we know it now, but only a loose confederation of thirty-nine German states. This came about through the upheavals caused by Napoleon. As for Australia, where I live now, it was a British colony of course and still had convict transports coming in. There were eighteen shiploads full in 1839, nine each to New South Wales and to Tasmania, which was still called Van Diemen’s Land. When I looked at specific historical events of the year 1839, there was of course no mention of anything that women had accomplished, but plenty concerning men’s achievements, such as British capture Hong Kong from China, or Charles Darwin elected Fellow of the Royal Society. There were few ‘world events’ that may have been of interest to the women of the day. Tea from India (not China) 1st arrives in UK (thereby making it more affordable), or Prussian government limits work week for children to 51 hours might have been the most likely. I was curious also whether there were any household manuals for women in the English speaking world. The best match that I came across was Mrs Beeton’s Book of Household Management which is still very popular today and is considered a ‘classic’ of its type. It is available online in full content, with an emphasis on food and recipes, but also contains a thorough guide for dealing with domestic help. Mrs Beeton’s book was published in 1861, twenty-two years after my manual, but unlike mine, is not forgotten. As for Australia, there was no similar publication. The Country Women’s Association of Australia, which might have published such a manual, was only founded in 1922. I discovered that there were actually twelve volumes of this German woman’s household manual. But getting hold of any of them proved just about impossible. For one, the publisher, Lewents of Berlin, had closed its doors long ago. At best, I could imagine there might be other copies of this manual still hidden somewhere in an attic, or maybe lost on the dusty shelf of an antiquarian bookshop. But it seems rather likely that I will be stuck with my lonely copy of volume eight. The old manual is not very large, about the size of a small paperback, a bit thicker than the average, but still handy for easy use. There are some signs of wear and tear, particularly on the hard cover; the pages though are only slightly yellowed. I had a thought to check for fingerprints, and other spots like food stains to see which entries were of most interest to the users of this manual. But I could find no clue to this. Only the index pages in the back seemed marked by heavier use, which would make sense, of course. They were a little darker. The cover design in light and dark brown shades reminded me of soap bubbles or a boiling broth, but this surely must be coincidental. There is no title, and no author listed on the outside, just a small light green square on the spine. This square shows some faint traces of lettering but is so faded it cannot be deciphered. Unfortunately my information did not mention the learned persons who gave input to this manual, such as whether any ‘experienced Women’ were consulted, but I believed that rather doubtful. In my representation of the title page here, I have used the same layout as for the woman’s manual, since this was not provided. There are some obvious differences: reference to ‘the Man’ versus ‘the female Gender’ which might confirm the lesser standing of the women of the time. And there is the obvious difference concerning expectations about each gender’s place in life and in society as well. The man had a profession and was active in society outside the home, whereas the woman’s place was strictly within the home with responsibilities as a wife and mother and, quite interestingly, in charge of the domestic help. While the men had responsibilities regarding the education of their children, there is no mention as to their responsibilities as a husband. All of this makes me so glad that I live now. While our current society is far from perfect, life has certainly improved, especially for women, who, in the western world at least are not confined to house and hearth, have opportunities for a profession and have the same responsibilities concerning their children’s education. Full equality, alas, is still a dream. My thoughts then turned to the intriguing question about the owners of this manual among my ancestors. Two four-leaf clover stalks (very dried) between pages 298 and 299 and the word ‘Volz’ scribbled on the title page inside were the only personal hints regarding the ownership of this book. The handwritten word in ink meant nothing to me. I assumed it was a surname, since I did not recognise it as a common word of the German language or a first name. Nobody with that name is known to me amongst my ancestors. As for the four-leafed clover stalks, was somebody just pressing them and had forgotten they were there, or were they put deliberately in this book, between those pages? They are in the middle of a rather confusing five page explanation of Schachspiel (chess). My search for clues of ownership had to continue then. As this manual was clearly meant for the mistress in charge of a well-to-do household that most likely included domestic staff, I would expect that it came from a household of some means and standing. From what I knew about my ancestors, based on old documents I’d found and what my family had told me, I had to say that most of them would not have been in a position to acquire twelve volume household manuals or any other books for that matter, with the exception of my paternal ancestors, the Schmiedebergs. They very likely had the monetary means and the status that would allow them to contemplate just such an acquisition. The head of this household, my paternal great-great-grandfather Karl Schmiedeberg was a master furrier and the mayor of the town, and therefore in good standing. Although my father was reluctant to talk about his ancestors, he proudly mentioned on occasion that his great-grandfather had been a mayor. I was able to confirm this from the information in my father’s Ahnenpass, the ancestry passport that was a required document for every German during the Nazi years. This was to prove your racial purity and had to include details down to your great-grandparents, including occupation. As I confirmed from my research, the ownership of books was definitely an important status symbol, a sign of learning and sophistication, but also of a certain wealth. My maternal grandfather was living proof of this; although the household manual could not have come from his collection, his lifetime was much later and he marked all his literary acquisitions with his initials and a date. But nonetheless, I found it fascinating that family lore states that my Grandpa Fritz, who came from very dire circumstances, was keen to acquire books as soon as he could manage to afford them as he rose in the public service; and he made sure that they were noticed, although there is considerable doubt whether he actually read them. I still remember two locked cabinets full of books, visible through the glass panes. All these were packed away into the attic when he had passed away and the cabinets were used for other storage. The attic was a dusty, narrow space in the top of our gabled roof. One naked light bulb and two tiny windows at both ends was all there was for a light source. The only way to get up there was by pulling down a trapdoor in the ceiling of the corridor with a hooked broomstick. The trapdoor had a ladder attached that had to be pulled out and extended to the floor. One needed strength to manage this and a good reason to proceed up to this musty, dusty place, so naturally we were not up there very often. Since I left home to go to university and then on to Australia, I had forgotten about the books until we needed to move my mother from the family home to my brother’s place, because she could not stay all by herself any more. This was in 2010. We cleaned the attic and the cellar too, and all these books now came to light and all were fairly well preserved. No mould or funny smells. Most came from Gandpa Fritz’s collection but there were others too, from who knows where, and one of them was volume eight of a German woman’s household manual. I picked this one and took it with me to Australia, because it was by far the oldest book that I had come across. I found it in one of the large cardboard boxes full of books; but there were letters too and documents and photographs, containing much of the life stories of my ancestors. All this is waiting for me to explore in detail, whenever I can make my way to Germany. Back in Australia now, I took a closer look at all this household wisdom in my manual from 1839. The index in the back showed 326 entries in 504 pages of very tight script. Some entries were very short and there were pages with up to three. To find what must have been considered the most vital and detailed knowledge required of the discerning mistress of a household of this time, I decided to take a look at those entries with the most pages first. I found, to my astonishment, that Schatzkästlein (little treasure trove) was the longest by far with no less than 25 pages. The next one down was Schnellräucherungsmethode (quick smoking, as in curing, method) with 20 pages, thence Rindfleisch (beef) with 18 pages, Sauce (sauce) with 16 pages, Rofe (rose) with 15 pages, Reinette (apple variety) with 12 pages and Schinken (ham) at 10 pages. Obviously, most entries refer to preparation and preservation of food except for Schatzkästlein and Rofe. The book has an unusual typeface where the ‘s’ looks like an ‘f’. It is one of the more obvious differences when it comes to the old-fashioned German font style used in this manual. It can be difficult to decipher, but thanks to my family research I had learned to read it well enough. As to the entry of the Rofe, the first part is all about planting and successfully growing roses in all their varieties, and horse manure is highly recommended. This is followed by the usefulness of rose products: rose water, rose honey, rose jam, rose vinegar, rose wine and more. At least that part is also food related. But of course the well-known and beloved perfume of the rose and its applications are certainly discussed as well. I finally decided to take a look at what kind of treasure the Schatzkästlein, the ‘little treasure trove’ was hiding. I found a metaphoric use of ‘treasure trove’ both in the German and the English language. But I was still unprepared for what came next. I started reading and found the first words puzzling: ‘Franklin has provided rules for living…’ Franklin? Yes, this referred indeed to Benjamin Franklin, one of the famous Founding Fathers of the United States and author, statesman, scientist and inventor. After a few lines of introduction, followed Franklin’s own words in translation on his well documented ‘thirteen virtues’, with some additional explanations from one or more of the ‘learned Men’ presumably. Franklin devised this list of virtues to enable him and others to live a proper, honourable, dignified and upstanding life. Here, in my little manual were those thirteen virtues which Franklin exhorted us all to live by, painstakingly describing his own attempts and not denying that he too fell short on occasion: Temperance, Silence, Order, Resolution, Frugality, Industry, Sincerity, Justice, Moderation, Cleanliness, Tranquillity, Chastity and Humility. And then I discovered that my household manual had expanded this to fourteen virtues. I searched for explanations of this discrepancy but could not find any further hint in regards to the additional virtue of Menschenliebe (humanity, humanism, literally: love of the human) in reference to Franklin’s virtues. So where did this fourteenth virtue come from and why was it added here? I found some clues: a Christian version of seven divine and seven worldly virtues and another set of virtues ascribed to Aristotle. But the most likely source and inspiration for the inclusion of those virtues into my household manual were probably the fourteen virtues of the Roman emperor Marcus Aurelius. Humanitas was one of his virtues and explained the extra virtue of humanity. Either the learned gent who wrote this entry made a genuine mistake or maybe this was added quite deliberately. Menschenliebe is certainly discussed within the ‘treasure trove’ and it does fit in very well with the whole concept. Of course, those virtues were established by a man, aimed at the men folk of the day, presumably, so I did wonder why they were given so much prominence in this household manual for women. Part of the answer might be that ‘learned Men’ were foremost in the input to this manual. Of course, the serious application to those virtues by their wives would certainly be most desirable for all the men folk. What did occur to me is that the women who read this would have to be well educated in humanistic thought and values to even understand its concepts. And there is further evidence that a certain level of sophistication was expected of the female readers of this manual: the entry schön (beautiful). This entry starts with an elaborate explanation of ‘beauty’ and its perception that can be quickly summarised as ‘Beauty is in the eye of the Beholder’. There is also mention of an inner beauty, a beauty of the senses, the idea of beauty and the like. And then I paused for thought. How could this be compared with such down to earth information on Scheuern (scrubbing), for example? This entry describes the correct method for scrubbing and scouring one’s pots and pans with special regard to tin plates and also wooden floors. There is a strong emphasis on the good housewife and host who would gain the utmost respect by having a properly scrubbed home. Or Säugen (breastfeeding): besides the insistence that mother’s milk is best for your child, there is a warning as to the length of time breastfeeding is to continue, a stern admonition that longer than 18 to 24 months runs the very serious risk of having your child die of water-on-the-brain. Then there is Schnellräucherungsmethode (quick smoking method), an entry emphasising the usefulness of well cured meat ‘when under siege’, your city or your town, that is. Or maybe Rothkehlchen (robin, the song bird). After two pages of almost lovingly describing how to capture, tame and keep a robin, the last sentence says, ‘Its meat is quite tasty and also good for your health.’ And the extermination methods concerning Ratten (rats) are truly awesome: drowning, poisoning, coating the live rat with a mixture of rancid cod liver oil and tar, and if that does not deter them, feed them bits of sponge fried in salted butter. Provide lots of water as well, because the salt will make them thirsty. When they drink, the sponge will soak up the water, expand and — bang! The rat explodes. I can hardly wait now to explore this manual’s suggestions concerning the elimination of Schaben (cockroaches) and Schnecken (snails) or Schildläuse (scale bugs)! These latter entries in the manual seemed to be a world away from philosophical discussions on beauty or a virtuous life, although much closer to what I had expected to find in such a household manual. I have only read a small number of the entries so far, the ones that looked most fascinating, and further exploration begs. I can already see exciting promise in such captivating information as Rauch aus dem Zimmer zu vertilgen (remove smoke from room), or Regen (rain), and Schnee (snow), or Säure im Magen (acid in the stomach), or Sachen (things? ), or Schreien (scream) or Schnürbrust (literally: tied breast, an early version of a corset). When looking at this book I had never imagined that a woman’s household manual from 1839 could be so fascinating, so illuminating about a woman’s everyday life as it was 176 years ago, and by association a man’s life too, of course. And then there are those mysteries as well: who of my ancestors did own this manual and who was ‘Volz’? Whatever happened to the other eleven volumes? Why is the largest entry a treatise about the thirteen virtues of Benjamin Franklin, and what about the fourteenth virtue? Why did the authors of this manual include such sophisticated concepts in a household manual for women? I doubt that I will ever find the answers to all these questions, but my investigation so far has been highly fascinating and quite revealing and it goes hand in hand with my research on family history. 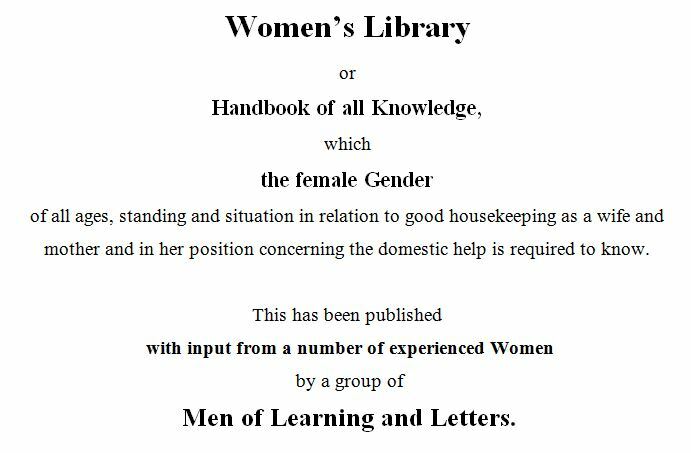 I must also mention yet another aspect of my investigation: I found much information on household manuals from 19th century Britain and the US, and other German publications too. I knew it would be fascinating to compare them all and I could not resist a quick perusal and found at least one unique difference to my own manual: no hint of such sophisticated concepts on beauty and a virtuous life. This made me truly regret that my unique manual has completely disappeared from view, and that I will most likely forever be deprived of its particular household wisdom except for what is found in volume eight: the entries of Rapünzchen (salad green) to Schuhwichse (shoe polish). Download a pdf of ‘Revelations from my German Woman’s Household Manual’.